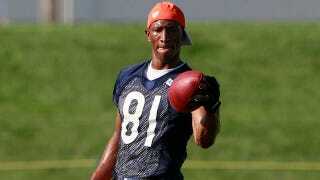 We figured that the case against Sam Hurd, who was arrested yesterday after allegedly attempting to purchase a large amount of cocaine from a federal agent, could get a whole lot messier as the details unfolded, but we didn't expect this: Chicago's 670 The Score reports that the police actually have a list "in the double-digits" of NFL players who were supplied drugs by the Bears wide receiver. According to the criminal complaint, Hurd told an undercover Homeland Security agent Wednesday night that he and another co-conspirator were already distributing four kilograms of cocaine a week in the Chicago area, but he needed more. He was seeking five to ten kilograms of cocaine and 1,000 pounds of marijuana a week to distribute and was willing to pay $25,000 per kilo of cocaine and $450 per pound of marijuana. That adds up to as much as $700,000 of drugs each week.